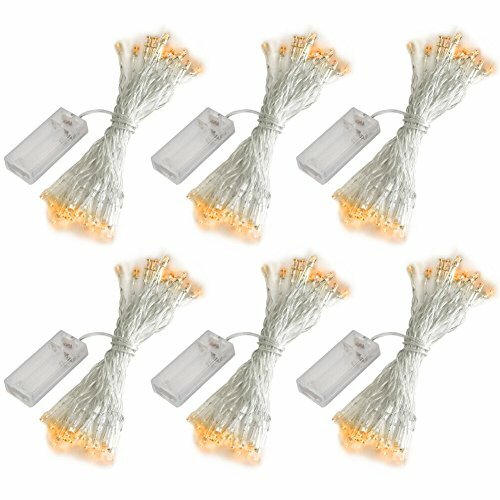 Accmor battery operated fairy string lights are such a great option to add beautiful lighting to your home decor without having to worry about long wires and plugs! It is very nice, and you will need it to create a beautiful effect for a number of events and holidays. 10ft/3m Length - The length of fairy light strings works well for doing a single strand down the center of a conventional event table, there are 30 leds on the clear wire. Easy to hide - The strands are clear and very flexible, this will make it easy to camouflage them in a variety of projects. The wires are kind of thin as they are fairy lights and delicate. 2 Lighting modes - These lights are nice and bright as well. You can either turn these lights on a solid light setting or a blinking light setting to meet your needs. Indoor/outdoor use - Can be used for both outdoor and indoor decoration light. Light up your holiday party with the clear string warm white lights or hang a strand of lights around trees and turn any occasion into an instant party. - Rave/party and nighttime fun run "apparel"